AVYCAZ® is indicated for the treatment of HABP/VABP, cUTI (including pyelonephritis), and cIAI (in combination with metronidazole) caused by designated susceptible microorganisms. 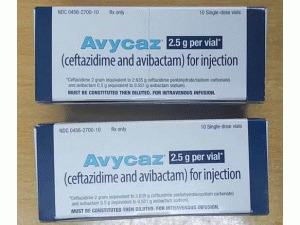 AVYCAZ® (ceftazidime and avibactam) is indicated for the treatment of hospital-acquired bacterial pneumonia and ventilator-associated bacterial pneumonia (HABP/VABP) caused by the following susceptible Gram-negative microorganisms: Klebsiella pneumoniae, Enterobacter cloacae, Escherichia coli, Serratia marcescens, Proteus mirabilis, Pseudomonas aeruginosa, and Haemophilus influenzae in patients 18 years or older. AVYCAZ, in combination with metronidazole, is indicated for the treatment of complicated intra-abdominal infections (cIAI) caused by the following susceptible Gram-negative microorganisms: Escherichia coli, Klebsiella pneumoniae, Proteus mirabilis, Enterobacter cloacae, Klebsiella oxytoca, Citrobacter freundii complex, and Pseudomonas aeruginosa in patients 18 years or older. In a Phase 3 cIAI trial, clinical cure rates were lower in a subgroup of patients with baseline creatinine clearance (CrCl) of 30 to less than or equal to 50 mL/min compared to those with CrCl greater than 50 mL/min. The reduction in clinical cure rates was more marked in patients treated with AVYCAZ plus metronidazole compared to meropenem-treated patients. Within this subgroup, patients treated with AVYCAZ received a 33% lower daily dose than is currently recommended for patients with CrCl of 30 to less than or equal to 50 mL/min. Clinical cure rate in patients with normal renal function/mild renal impairment (CrCl greater than 50 mL/min) was 85% (322/379) with AVYCAZ plus metronidazole vs 86% (321/373) with meropenem, and clinical cure rate in patients with moderate renal impairment (CrCl 30 to less than or equal to 50 mL/min) was 45% (14/31) with AVYCAZ plus metronidazole vs 74% (26/35) with meropenem. The decreased clinical response was not observed for patients with moderate renal impairment at baseline (CrCl 30 to less than or equal to 50 mL/min) in the Phase 3 cUTI trials or the Phase 3 HABP/VABP trial. Monitor CrCl at least daily in patients with changing renal function and adjust the dosage of AVYCAZ accordingly. The most common adverse reactions in cIAI patients (≥ 5% when used with metronidazole) were diarrhea (8%), nausea (7%), and vomiting (5%). The most common adverse reactions in cUTI patients (3%) were diarrhea and nausea. The most common adverse reactions in HABP/VABP patients (≥ 5%) were diarrhea (15%) and vomiting (6%). 上一篇：Fucidin Tab 250mg（夫西地酸片） 下一篇：Cubicin 500mg Injection(Daptomy..